Surya Namaskara – or Sun Salutation – and the Adobe PDF download of all eleven postures from Charlotte’s 108 Yoga Pose Drawings! Why Surya Namaskara? It is short! I love it for those mornings when nothing is going the way it should and there is a million things you need to do before jumping off to work, or school, or wherever you may need to go. Sun Salutations are also fantastic for coffee breaks or lunch breaks at the office too. Surya Namaskara is a series of eleven asanas (many add prayer pose as a start, increasing the number of poses to twelve) which may be performed on various levels of awareness, from the purely physical to fully incorporating Pranayama, and specific Mantras and Chakra meditation during each pose. We will focus on the postures themselves, each illustrated directly from the Adobe document you may download at the end of the article. Please note: Performing this series twice is considered one round of Surya Namaskara, but it is not necessary if time does not allow. Tadasana – Mountain Pose: This pose promotes happiness, improves posture and creates space within the body. It also strengthens the abdomen and legs, reduces sciatica and helps flat feet among many more benefits. Utthitta Tadasana – Raised Hands Pose: This pose relaxes the back and neck muscles, strengthens shoulders and spine, as well as positively affecting the Thyroid gland. Uttanasana – Standing Forward Bend Pose: This pose stretches legs, spine, and hamstrings. The mind is calmed, and the liver and kidneys are stimulated to help improve digestion. Ardha Uttanasana – Half Standing Forward Bend: This pose stretches the front torso, strengthens the back and improves posture It also stimulates the belly and is a good pose for those with back problems. Chaturanga Dandasana – Four-Limbed Staff Pose: This pose strengthens the arms, wrists and abdomen, and helps prepare for more difficult poses. Urdhva Mukha Svanasana – Upward Facing Dog: This pose opens the chest and is very valuable for asthma sufferers. It also helps relieve mild depression and fatigue, as well as stimulating the abdominal organs. Adho Mukha Svanasana – Downward Facing Dog: This pose energizes the body, calms the mind, and strengthens the digestive system. It also can help relieve backache and strengthen the back. 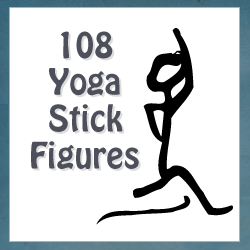 When you order Charlotte’s 108 Yoga Pose Drawings, you receive everything as outlined on the following information and order page, but I want to draw your attention to the Sun Salutations of which you receive the classic Surya Namaskara, an “A” and “B” variation, as well as Chandra Namaskara. The download below provides you with a complete page of all the postures as illustrated above, in order. When learning Surya Namaskara, I took my laptop outside with me and sat it in a chair so I could reference the drawings and order of Asanas as I practiced. Any of these wonderful drawings may be printed as well. On a personal note, I found the drawings to be of great benefit in quickly remembering how the poses are to be performed and in what order; whether you choose to make your own posture sequences or order the postures according to your existing practices. Wonderful artwork and certainly in touch with the ‘flow’ of Yoga! I give Charlotte’s 108 Yoga Pose Drawings a perfect score of 5/5 and would recommend them to anyone.